Hi there, faithful readers, friends, people who stumble upon this blog. I have a story that has the potential to make you really uncomfortable so here we go. I will regret this blog by tomorrow and most likely remove it. If you're my mother, just stop reading now. 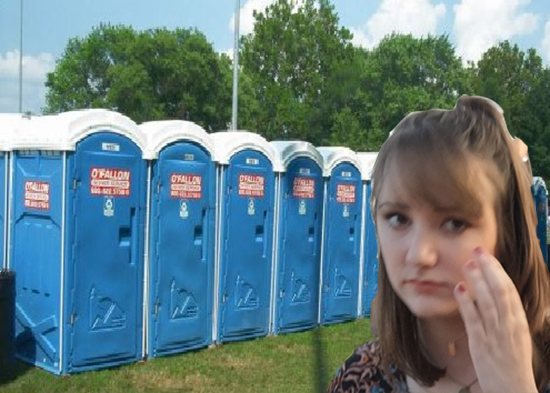 I had the worst porta potty experience at a Taylor Swift concert, she should send me a check. Yes, this past weekend, I went to a Taylor Swift concert on my birthday. Her only concert of 2016. On my birthday. In my state. I can't even get into the how much of a God-thing that is because I have a piss story to tell. Before the concert even began, I had to pee. I didn't want to risk leaving at the beginning of the concert because what if she came out with a new hairdo, new outfit, naked, with Kanye West, I just didn't want to risk it. So I took the advice of my friends "Just don't think about it" and tried to dance to shake up the pee in my bladder. But toward the end of the concert, I could not hold it any longer. Just as she was about to start Out Of The Woods, which I knew was going to be her second-to-last song, I darted for the porta potties. I weaved in and out of people and finally found the large stalls of piss. I waited in line and then jetted in there as soon as I saw a nice young lady exit. It was pitch black in the porta potty. PITCH BLACK. I had to pee so bad, I didn't have time to get out my phone to illuminate any light anywhere. IN FACT, I apparently didn't have time to lock the door, but more on that in five minutes. lololololololihateme. So I start peeing while squatting, not fully sitting on the disgusting potty because I'm actually not a monster, when all of a sudden, I feel pee on the back of my legs. And I'm like, oh that's weird, CAN I NOT AIM???? But it's so dark, like I can't see anything, I have to pee so badly, I can hear Taylor singing, it's my birthday, this is 26. So I'm peeing and I still occasionally am feeling pee, but I continue to pee for oh, I DON'T KNOW LIKE 30 SECONDS, BEER PEE IS REAL, DON'T DRINK AND PORTA POTTY. At some point, some young snot child peeps open the door because I forgot to lock it and I yelled at her, I'm pretty sure her Taylor Swift experience was ruined just based on my interaction with her, oh well, I'm not sorry. I eventually stop peeing and start to lift up my pants that are like soaking at this point. I turn around to look at the toilet and I realize the lid was never lifted. The lid was never lifted. I peed on a toilet lid. The toilet lid was black and I couldn't see it. The woman before me closed a toilet lid in a porta potty. The woman before me is apparently Princess Kate. I got pee in my pants. I had piss pants at my hero's concert.